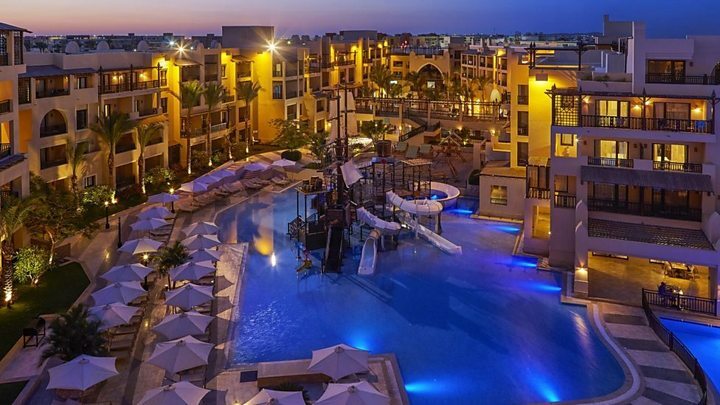 One British tourist said it was a "bit scary"
No trace of poisonous gas has been found in the hotel room occupied by a British couple who died, according to Egyptian investigators.John Cooper, 69, and his wife Susan, 63, from Burnley, died at the hotel in Hurghada on Tuesday.The couple's daughter, who was also at the hotel, said she believed the deaths were not from natural causes.A number of British holidaymakers who were staying there have been flown home early by tour operator Thomas Cook.Following the deaths, the firm said it was removing all its customers as a "precautionary measure", with 301 holidaymakers offered the option of moving to different hotels or being flown home. A plane carrying people who had stayed at the hotel arrived at Manchester Airport in the early hours of Saturday. Passengers told BBC News they had not been informed of the deaths until two days after they occurred.One woman said: "No-one had said a word until Thursday. But it is a bit scary. "Another said: "When you find out at 10:00-10:30 at night that two people have died two days ago, and nobody knows why... "If they'd been open and transparent, I wouldn't have got on that plane." In a statement, Egyptian prosecutor Nabil Sadeq said a technical inspection of the hotel room could find no trace of toxic or harmful gas emissions or leaks.The result of forensic analysis of samples taken from the bodies was still awaited, said the statement.The Red Sea governorate said medical checks by a health inspector revealed "no criminal suspicions".The couple's daughter, Kelly Ormerod, said: "I believe their deaths are not due to natural causes. "My parents went to sleep on the Monday evening, fit, healthy and in good spirits, and awoke the following morning in very poor health." Mr Cooper died in his hotel room at the Steigenberger Aqua Magic resort at 11:00 local time on Tuesday, according to a statement by the Egyptian authorities.He had suffered a "sharp drop in blood circulation" and his cause of death was listed as "sudden failure in the heart muscle and respiratory failure".Mrs Cooper was taken to hospital five hours later in a "state of fainting" and, although heart recovery work took place for 30 minutes, she died at 17:12. The statement said her cause of death was a "drop of blood circulation and respiratory functions". It said the hotel was last audited late last month and received an overall score of 96%.Sven Hirschler, senior director of corporate communications for Deutsche Hospitality, which owns the Steigenberger brand, said there was not an unusual level of illness among the 1,600 guests staying at the hotel.He said that Mr Cooper had complained of low blood pressure and was treated by the hotel's on-site doctor on the day he died.Janette Rawlingson, 43, from Chelmsford, Essex, who arrived at the hotel with her husband and two children on Tuesday, said Thomas Cook staff told guests at a meeting samples from the restaurant and swimming pool were being tested. "Other guests are saying there are 40 people ill at the hotel with vomiting and diarrhoea," she said. "A reasonable person can't help but wonder if there's a link between that illness and these deaths."